Hi there Steemit community, today, November 1st, is World AIDS Day and it means a lot to me because it serves as a great reminder that life is short and that we should love people today because they just might not be there tomorrow. I lost someone close to me to AIDS on July 16, 2008, and it was the most painful experience of my life. It changed me. In case you didn't know, today, November 1st is World AIDS Day. In the US, AIDS has gone down by 50%. However, according to the World Health Organization, there are still more than 36 million people around the world who are living with AIDS - a staggering number! The question to ask here is how can we get that number to go down even lower and eventually completely solve this crisis that affects millions directly with the disease and many more millions indirectly. I lost someone very close and dear to me to AIDS and it was a painful experience beyond anything that I have ever experienced. 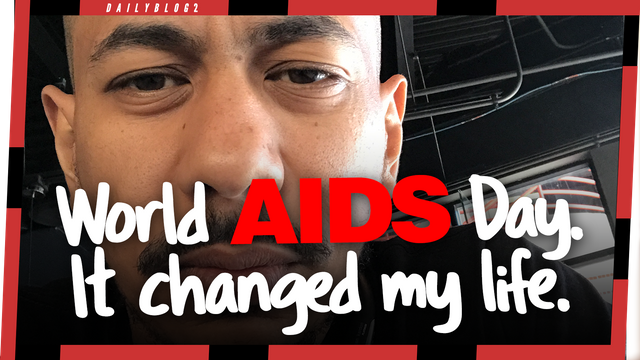 Seeing firsthand how HIV becomes AIDS affects those going through the cycles of the disease is heartbreaking and leaves you feeling helpless and completely empty. It's still an experience that I rarely talk about, and that I wanna forget most days when I remember or when I'm reminded - like today. I ask myself every year, how can we solve this crisis? I propose that our world leaders should put the health and the well being of all humans beings regardless of age, race, religion and economic status at the forefront of issues that need to be addressed immediately. Just imagine how many lives are lost each year to not only AIDS but other senseless diseases claiming the lives of our loved ones. And yet, we spend all of our resources on improving ways to hurt and kill each other. The United States Armed Forces budget alone is $597 billion - the largest armed forces budget in the world. Just imagine for a second the impact we can make if we put $597 billion towards health care and the bettering of all humans beings and mankind. And this is why I lose hope sometimes in mankind. Our number one priority seems to be to hurt and kill each other. It sounds sad and even depressing but that seems to be the case. When will this stop? Will it ever stop? Will we ever grow to respect all human beings? Too many questions that I'm not sure will ever be answered. In the meantime, remember that positive vibes attract positive vibes. Now go out there and spread love, hope, and unity.